Restoration of the State Park has been underway for 30 years. The focus has been on removal of exotics and the cultivation of native plants. Ailanthus has been brought under control in Aliso Canyon. Workers have also “built” two bridges over Aliso Creek and restored the banks with willows. These bridges (the base of which are old flat bed railroad cars) allow bikers and hikers to pass over the stream instead of through it. Several bridges have needed to be rebuilt because of the 2008 Freeway Complex Fire. Thistle is another weed that plagues the Park. Aided by the disturbance that cattle grazing caused, this prickly plant often grew to seven feet tall. 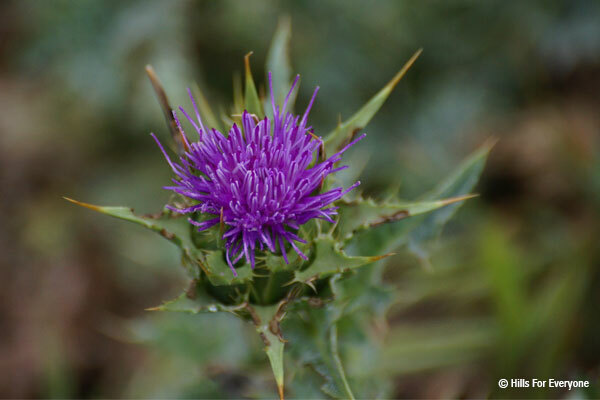 In spring, the thistle’s strategy is to send its broad leaves out quickly and deny access to the sun and rain for native plants. Thistle ran rampant through the Park especially along streams. It was so thick it often blocked access to the water. The 2008 fire has caused a resurgence of this difficult-to-eradicate weed. 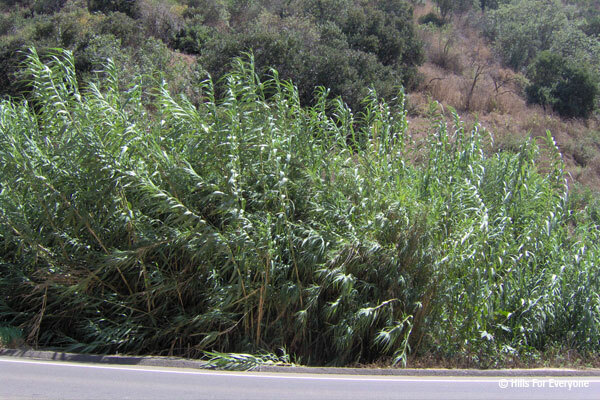 Arundo donax is a non native bamboo like plant that was brought into the hills for stream bed stabilization but it is such a “water hog,” (growing 3 -10 inches per day depending on water supply) that it chokes out native vegetation. It is also biologically useless in this region. Because it doesn’t branch birds can’t nest in it and because it contains silica (glass) animals can’t eat it. Carbon Creek which terminates In Chino Hills State Park and Carbon Canyon Regional Park contained acres of Arundo stands. During the Freeway Complex Fire the flammable Arundo acted like a wick and carried the fire upstream from Brea toward Chino Hills. Following the fire it was nearly completely burned down offering an opportunity to attack it. Over eight agencies have cooperated in a joint effort to permanently remove Arundo from this watershed. After burning to the ground, the regrowing Arundo was sprayed. Amazingly the dead and dying stalks were less flammable than the 30′ high live stalks. Then the biomass (dead vegetation) was removed. Any surviving Arundo was sprayed again and removed again. Today only 2 small stands remain and they too will being attacked. The State Park has been the recent recipient of two grants awarded by the Orange County Transportation Authority as part of its Measure M Environmental Mitigation Program. The first grant will complete the restoration of the northern portion of the Coal Canyon Wildlife Corridor while the second grant will cover riparian restoration in Telegraph Canyon.